Investing in a new computer means benefiting from the latest technology and provides you with the ability to run software faster than before. But the chances are that your old computer was not only packed with the software you have become used to working with, but was also customised and configured in various ways. The process of manually configuring these personal settings and reinstalling all of your software can be a lengthy one, but Laplink PCmover can help by taking care of this arduous task for you. The program can move all of your software, music, documents, games, web browser settings, Windows customisation and more to a new computer in a faction of the time it would take to do so manually. All that is needed is a network connection, removable media such as CDs, DVDs or a USB drive, or a Laplink USB cable, and in a matter of minutes, your new computer can be made to feel like home. You can choose which files and folders you would like to keep, but the Home edition does not allow you to select the applications you want to migrate. It's all-or-nothing with Home. The program also comes in handy if you are upgrading your hard drive as it can be used to transfer your existing Windows installation between drives or partitions in much the same way. The entire process is wizard based so there is no scope for going wrong, but migrations can be reversed if necessary. Simple install and run the program and both computers and start the transfer process on the new machine - you will be guided through every steps of the way and your new computer will be ready to use before you know it. Note that this the Home edition of Laplink PCmover, which enables you to move all your applications and installed users. 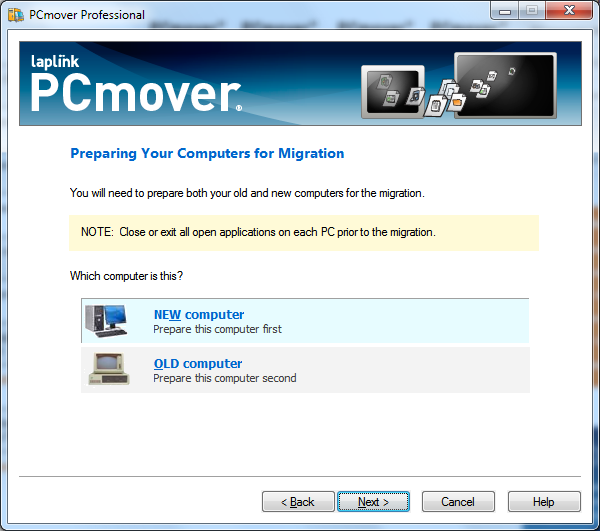 If you want to select the applications you want to move to your new computer, or select the user accounts you want to migrate, consider the Professional edition of PCmover. A comparison chart can be viewed on the Laplink website. PCmover can migrate your PC across a network, Laplink USB cable, Windows Easy Transfer Cable or any type of removable media that can be read by both PCs. If your computer has multiple users, PCmover gives you the option to migrate some or all of the users at once. The security information about file ownership and access control is preserved for each user. You can even use PCmover to migrate your PC to an Intel-based Mac using VMware Fusion, Parallels or Bootcamp. Note that PCmover does not include the USB 2.0 PC<>PC file transfer cable. You can purchase this separately from this store.